15 Feb 2019, 3:25 p.m.
A better career starts here at Gloucestershire Hospitals NHS Foundation Trust. Make a difference and become a healthcare scientist! 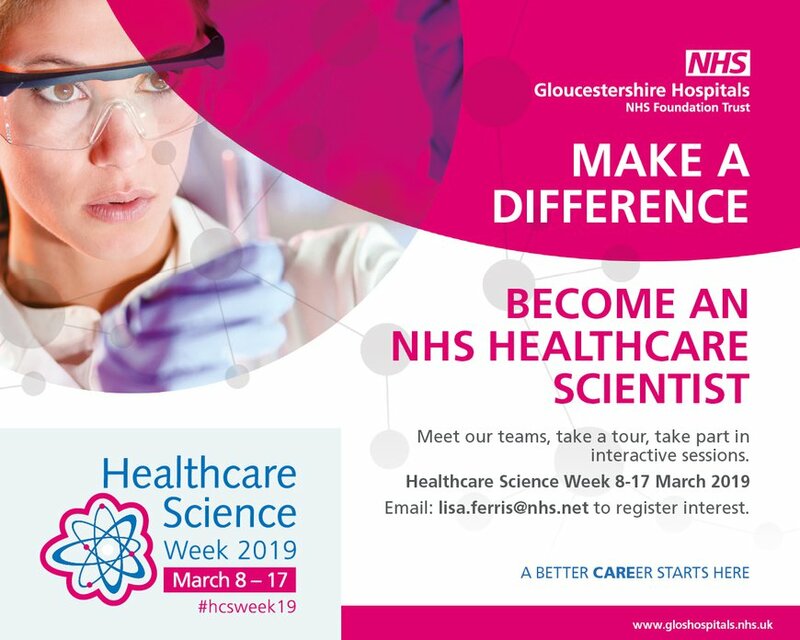 During Healthcare Science Week we are inviting year 11s and above to meet our teams, take a tour and take part in interactive sessions. Fill out this form to book your session or email to find out more or watch the film we have developed to showcase Healthcare Science careers at our hospitals. Come and visit the exciting world of Pathology at our Gloucester site. The tour covers the Pre-Analytical area, Chemical Pathology, Microbiology, Haematology & Blood Transfusion. Come and visit the exciting world of Pathology at our Cheltenham site. The tour covers the Pre-Analytical area, Histology, Cytology, Chemical Pathology, Haematology & Blood Transfusion. This is a unique opportunity to observe in a small group a tissue cut-up session within the Histopathology Department. Led by one of our Histopathologists, this will provide an insight to the important role that Histopathology plays in diagnosing disease. The tour of the department will involve practical interactive sessions covering the different types of test undertaken in the department. These will include Brain Activity and Nerve Conduction studies including the chance to use the equipment to take recordings on a staff volunteer. The hour will consist of a tour and overview of Vascular Science and the different tests and imaging studies that are performed. This will be followed by a practical demo with one of the vascular ultrasound machines and a continuous-wave Doppler used for assessing and measuring blood flow. This will be run by the Ophthalmic Imaging team and will show an overview of Ophthalmic imaging alongside a demonstration session of some of the latest Ophthalmic imaging equipment. The session will include a tour of the Lung Function and Sleep labs on the Thursday and on the Friday will also include the Gastroenterology Lab. Sessions will be interactive and there will be the opportunity to undertake practical tests on the lab staff! This half day workshop will provide a unique opportunity to meet the Therapy team and provide an insight into the professions of Occupational Therapy and Physiotherapy. The workshop will also include information on the Therapy Support Worker apprenticeship. Come and meet members of the Radiotherapy team. An initial overview of the service and the range of professions involved in delivering treatments will be provided by the Therapy Radiographers. This will be followed by the chance to look inside one of our Linear Accelerator treatment rooms and to speak to other professions including members of the Radiotherapy Physics and Oncology Engineering Workshop teams. A workshop tour of the Audiology department to explain the profession and demonstrate the types of equipment that are used in Hearing Services. The tour and demonstrations will be led by one of the Audiology team and will provide the opportunity to ask about routes into the profession, including apprenticeships. This workshop will explore how we can use light to detect and diagnose disease. Come and meet the team of scientists that are completing research and developing new techniques that will change the way we identify disease in the future. Attend a master-class in technical and laparoscopic surgery and be introduced to basic surgical skills including suturing techniques and cyst removal, before performing a series of group challenges involving keyhole surgery. A tour will be provided of the Nuclear Medicine Imaging department and will provide the opportunity to see a gamma camera in operation. Examples of the types of imaging studies performed will be on display and there will also be the opportunity to discuss and explore the different career pathways within the broad discipline of Medical Physics and Engineering. In the field of Reconstructive science a practitioner will find themselves dealing with an assortment of patients requiring specialist treatment due to cancer, malformation, or trauma. You will find yourself working primarily in areas such as the mouth, face and skull but not limited to this with other body prosthesis required by specialist patients. For this practical session you will consider the provision of an orbital prosthesis, a type of facial prosthesis designed to replace the loss of an eye and the surrounding tissues, examining on the sculpting that would be required to create an accurate prosthesis. The session will focus on a mid-stage of prosthetic rehabilitation, undertaking a prosthetic eye positioning, using a resin example model of a patient who had an orbital exoneration and clay as our sculpting medium, to try and produce an orbital prosthesis sculpt. Students will be given a tour of the Gloucester Pharmacy department which will provide a unique insight into the broad range of tasks that are performed by our Pharmacists. As well as seeing first-hand the work being performed there will also be the opportunity to speak to staff to ask questions about career pathways into the profession. There are three separate sessions running. Session 1 is an ultrasound demonstration and will cover a practical demonstration of ultrasound and a discussion about why we use ultrasound and its benefits. Session 2 is a tour of the X-ray department and session 3 is a diagnostic Imaging talk covering CT, MRI, X-Ray, Cardiac/Interventional Imaging and ultrasound and a discussion about our Apprenticeship programme and life as a student radiographer.